If you have a family member who lives and breathes baseball, then a baseball-themed bathroom will not go amiss. You can make your sports fanatic’s day (or week) by adding a few simple items to a standard bathroom – nothing unusual or intrusive that would make normal bathroom use difficult. Just a few decorator touches that will make baseball enthusiasts smile. One of the fun aspects of our computer age is the ability to digitally print pictures on fabric. You can select from a company’s pre-selected designs or you can submit one of your own to have printed on shower curtains, bathroom rugs, and seat covers. The results can be spectacular. In a small bathroom, too much of a repeating pattern can be overwhelming, so it might be a good idea to have a big picture on the shower curtain, and to then repeat only portions of it on the rugs and other decorations. Most fabrics that are printed in this way are colorfast and machine washable. A nice picture or two, or a framed mirror are a nice addition to the bathroom. However, keep in mind that bathroom moisture can be hard on framed posters and similar items. Laser printed metal pictures are a good answer to the steamy heat in a bathroom. Aluminum with its moisture resistance is especially nice in this way. Baseball-themed items such as glasses holders, soap dishes, and sanitary paper holders can further your selected décor. Look for items that have quality construction and that will look tasteful rather than tacky. Durability should also be a factor, unless these are temporary decorations, such as for an after-game party. Ordinarily too much baseball could be overwhelming, but as a party theme, it is hard to overdo. Baseball is a game that evolved in the sandlots of America, taking advantage of empty spaces to create fun for families and for company teams. You can commemorate baseball and show your enthusiasm with your décor. Several examples are listed below. You can mix and match or select one or two items, depending upon your ideal baseball theme. Celebrate your favorite sport with a curtain rod with a baseball on each end. You could add curtains with a baseball-themed print to go along with it, or just add curtains with a coordinating color. One thing is for sure, it will certainly say, “Let’s play ball!” That could be one way to get going in the morning. Ordinary framed pictures or prints have a good chance of being damaged by steam and atmospheric moisture in a bathroom. But you can enjoy this well planned photographic print on metal without fear that it will be harmed. The piece is aluminum with the colors printed into the metal using special dyes. The result is a brilliant picture that is resistant to damage. This funny figure will keep you laughing while it keeps track of your glasses. A batter figure with a baseball for a head has an exaggerated nose and tiny protuberant eyes. The nose has a bump designed to hold your glasses while you are taking a shower or washing your face. No more fumbling around for where you left your “eyes” while your mind was busy with something else. Keep your little slugger warm and dry with this Bacati baseball hooded towel. Soft cotton percale terry soaks up moisture while being gentle on sensitive skin. Printed with a cheerful baseball theme, it is will grow softer with every wash. Made from 100% cotton, it is a “green” fabric that wears well and is organically produced. Make a bold statement with a baseball-themed shower curtain. The picture shows a cluster of baseballs underscored by a wooden baseball with a wrapped handle. The curtain is digitally printed on waterproof, quick-dry fabric so allow extra time for printing before mailed for delivery. Curtain liner is advised, and matching bathmats are available for your pleasure. 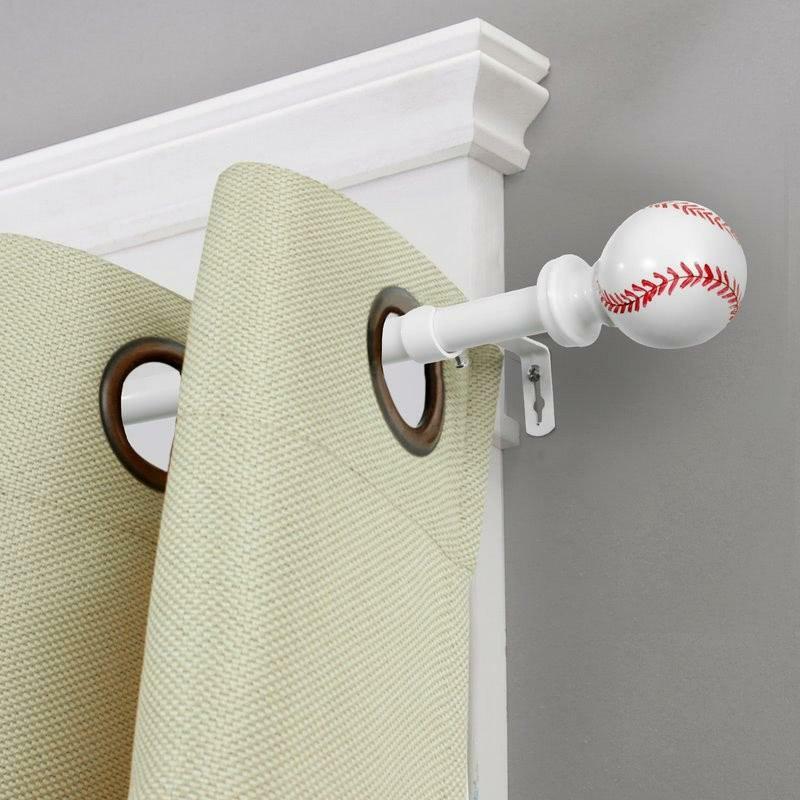 Dress up your baseball themed shower curtain with baseball shower curtain hooks. Plastic baseballs decorate shower hooks. Users report that the hooks are small, so plan for a slender shower curtain rod, or to attach to auxiliary hangers. Overall, an added way to create a baseball-themed bathroom. Item is digitally printed, so allow printing time before expecting delivery. High-density, non-woven fabric bath mat printed with a baseball and crossed bats. No skid backing. Machine washable, colorfast. It’s a great way to carry your baseball theme to the floor of your bathroom, as well as providing added comfort. Matching shower curtain is available. Bathmats and curtains are digitally printed, allow two days extra time for printing. Decorate your bathroom with baseballs – on the seat, in front of the seat and on your bathmat. Soft flannel surface, high-density non-woven material, with non-skid backing. Set is completely machine washable, and is colorfast. It is the easy way to coordinate any bathroom for your baseball fanatic without nails for hanging or sticky residue. Round baseball stitches use anywhere circular mats are great for your bathroom. But you can use them anywhere – in your entryway, to protect your living room carpet or to keep the mud in the mudroom for the back door. Made from coral cashmere and memory foam, they are the perfect party decoration that can protect your regular carpeting. Nine inch by nine-inch stick anywhere baseball décor bathroom decal can be applied to the toilet tank, walls, or just about anywhere you wish. Guaranteed not to leave residue, it is a safe and easy way to personalize your area. The sticker shows the curved stitching and the edge of a baseball. An easy way to delight your baseball fanatic.